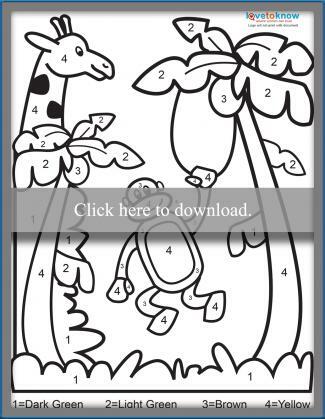 Kids color by number printables are much more than basic coloring pages. Kids of all ages practice color identification, following directions, and fine motor skills while they create an awesome image when using color by number worksheets. You can find different types of color by number pages to suit your child's developmental level. Click on the image you like best to download and print for use at home or in the classroom. If you need help downloading the printables, check out these helpful tips. 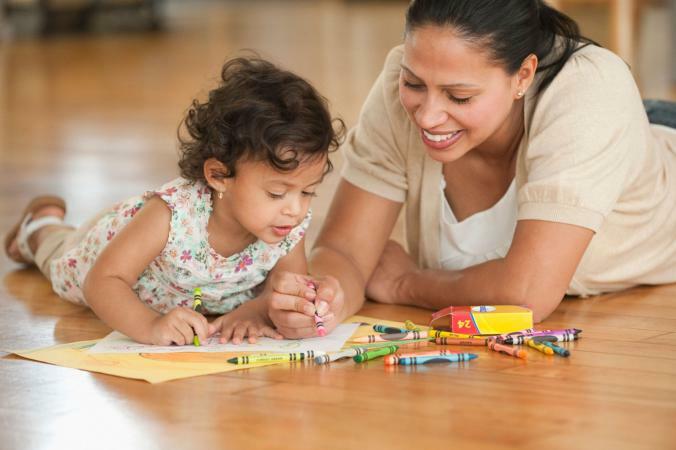 Many children begin learning and practicing colors and numbers when they are toddlers. If you are teaching your little one these concepts, start out with a simple color by numbers activity that uses only two or three colors and numbers. An image like this beach scene clearly shows the end result so it won't be overwhelming for a very young child. Kids in preschool and kindergarten know their colors well and may even know numbers beyond 20. A color by number page that includes a more complex image can challenge their ability to follow directions and notice smaller details. Kids in Kindergarten through Grade 2 who are working on adding single-digit and double-digit numbers can practice math skills while doing art with an addition color by number page. 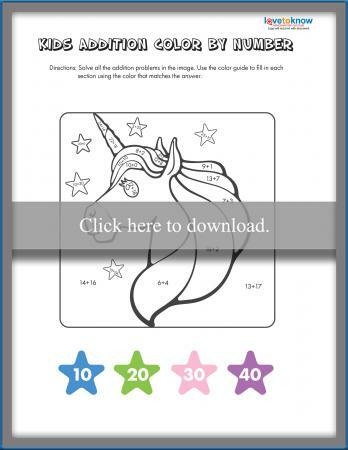 After solving all the math problems in the image, kids will discover a magic unicorn by coloring each section based on the addition sentence solution. The final image is depicted on an included answer key so kids can check their own work. If your child has mastered the easy color by number printables, try the advanced version where the images are hidden until the picture is colored in. With seven different colors and numbers to fill in, kids will discover a winter mountain scene as they work. The included answer key helps kids see any details they missed. Older children in upper elementary grades can still have fun with modern color by number worksheets. 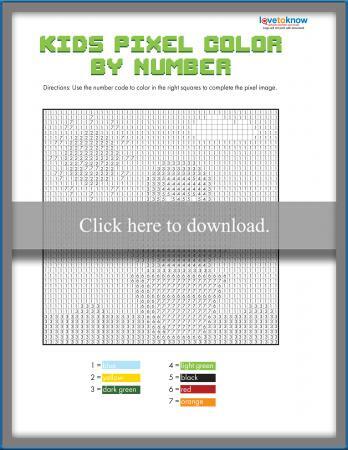 This pixelated color by number page features a grid and seven number/color combinations. The final image is not obvious until it's nearly finished; then, kids will find a cute pixel cactus. 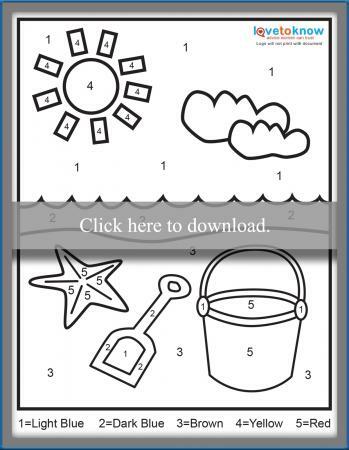 An answer key is included for kids who need help completing the image. You can give a child the color by number page and let them at it, or you can look for more creative and interesting ways of using these classic worksheets. Use an advanced or pixel color by number page to make a group coloring competition. Line kids up like you would for a relay race then shout out a number or color. The first kid on each team races down to their color by number page and fills in as many of the sections you called out as they can in 30 seconds. Call out the next number or color and that player must leave their page and tag the next person on the team. Play continues until one team finishes their image correctly. Let kids randomly choose which color goes with each number before handing out the printables. Each kid will end up with a unique image. Ask kids to look at a difficult color by number page and try to pick out what the end result is supposed to be. They can use any colors they want to fill in the image they see, which may or may not be correct. Cut out each individual image from an easy color by number page. Let kids color in all the elements of each image then glue them to a background image they drew. Print the coloring page on cardstock or another heavy-weight paper. Use glue and tiny seed beads to fill in the image so it looks like a mosaic when done. 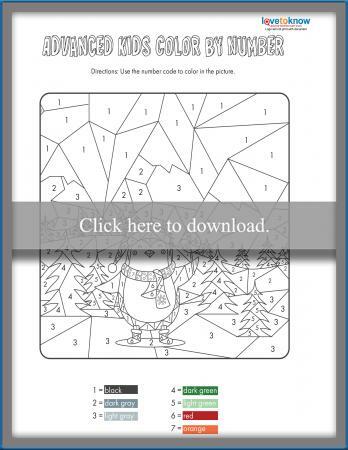 Color by number worksheets are fun for kids of all ages and add a degree of difficulty to the simple act of coloring. Encourage your child's creativity and help him or her brush up on math skills with some of the many printables available online.